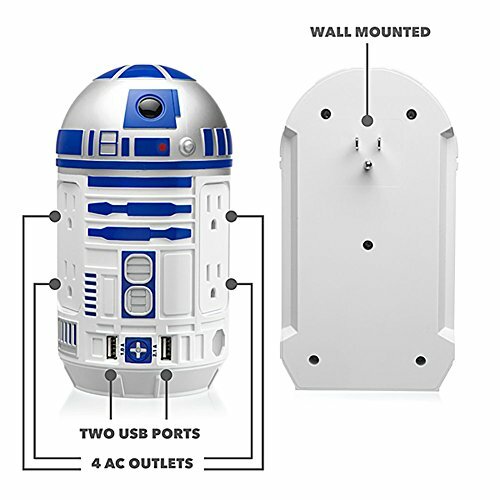 FOR THE STAR WARS FAN - The R2-D2 AC/USB Power Station is for the Star Wars fan. The Force won't be able to charge your gadgets but this little R2-D2 can. 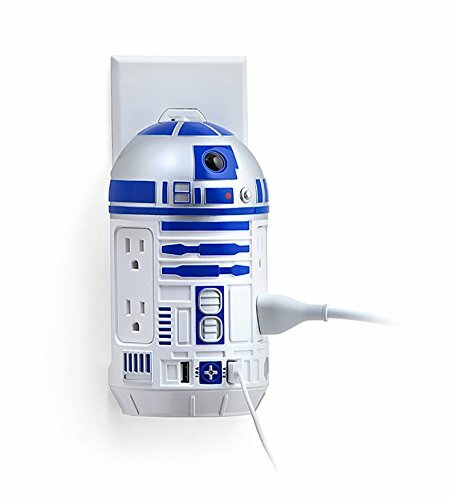 WALL-MOUNTED - This little droid is wall-mounted and plugs into a Type B socket. 2 USB PORTS, 4 SOCKETS - It provides two USB ports and four US standard sockets for all your charging needs. PERFECT IDEA AS A PRESENT - This is an excellent idea for a present on any occasion. Any Star Wars geek is going to love the R2-D2 Power Station and will thank you for it. OFFICIALLY-LICENSED STAR WARS MERCHANDISE - This Power Station is an officially-licensed Star Wars merchandise, and a ThinkGeek creation and exclusive. This Star Wars R2 D2 Power Station is really only for a true Star Wars fan. The Cute little guy provides two USB ports and four US standard sockets for all your charging needs.